This tour starts in front of LA City Tours, near the Hollywood Walk of Fame. Feel the magic of Hollywood as you visit memorable locations from hit movies. Look for your favorite celebrity hand-prints at the TCL Chinese Theater and search for their names on the Hollywood Walk of Fame. You'll also see Madame Tussaud’s Wax Museum, Hard Rock Café, Dolby Theater — the new home of the Oscars — and many other fun attractions along the world famous Hollywood Boulevard. Go inside Griffith Park from high above Los Angeles. Have your picture taken in front of the world famous Hollywood Sign – while also seeing spectacular city views. Don’t leave the city without these memorable moments. No trip to the “City of Angels” is complete without a great picture of the Hollywood Sign. Tour Beverly Hills, Bel-Air, celebrity homes and more. Visit beautiful mansions, night clubs on Sunset Strip, (the Whiskey A-Go-Go, the Viper Room, the Roxy, and Chateau Marmont), and the most expensive shopping street in America – Rodeo Drive. 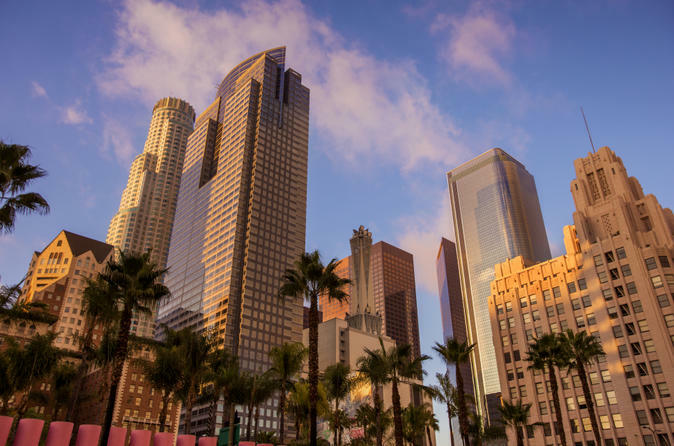 Visit the beautiful sunny California coastline and the high energy dining and night life of Santa Monica, Third Street Promenade, and Venice Beach. The A1-Noon LA City Tour also stops at Marina Del Rey. See the Disney Concert Hall, Nokia LA Live, Staples Center (home of the Lakers).